The narrative of Letter to Eros anchors itself in the ubiquitous discourse of love, written in transit during an exotic journey between East and West. 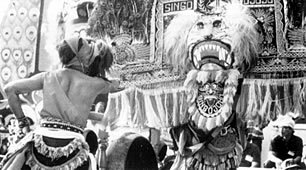 Half of the films journey directs itself towards the Jaranan trance dance of Kediri (East Java), and the Revog trance dance of Ponorogo (East Java). Can the practices of enchantment from the deep past inform us about the nature of the postmodern delirium now unfolding and still to come?